ARLINGTON, VA; July 5, 2012 – PBS announced today that A CAPITOL FOURTH dazzled audiences for a 32nd year. The star-studded celebration took the top spot of the hour and averaged 6.3 million viewers (Nielsen Fast National data, 3.8 household rating). 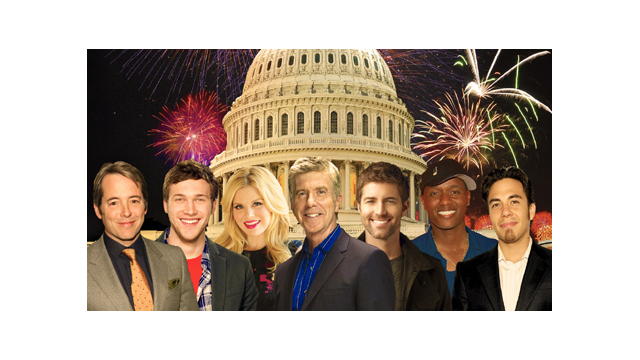 “Dancing with the Stars” host Tom Bergeron led the nation’s 236th birthday celebration, live from the West Lawn of the U.S. Capitol. Some of America’s newly minted favorite performers and household names came together for a night of music and the country’s most spectacular display of fireworks. In honor of the London Games, a group of American Olympians joined eight-time medalist Apolo Anton Ohno for a heartfelt sendoff. Featured performers included “American Idol” winner Phillip Phillips, Matthew Broderick and Kelli O’Hara, “Smash” star Megan Hilty, “The Voice” winner Javier Colon, country star Josh Turner, Kool & the Gang, English tenor Russell Watson, composer John Williams and the National Symphony Orchestra under conductor Jack Everly. About Capital Concerts Capital Concerts is the production force behind two of television’s longest-running and highest-rated live programs commemorating America’s most important holidays. The NATIONAL MEMORIAL DAY CONCERT, the nation’s tribute to our men and women in uniform, and A CAPITOL FOURTH, our country’s biggest birthday party, have become American traditions that have consistently ranked among the highest rated programs on PBS over the past decade. Both holiday specials have been honored with over 70 awards including the New York Film Festival Award, the Telly Award, the Golden Cine Award, the Videographer Award, the National Education Association Award, the Aurora Award, the Christopher Award, the Communicator’s Award, the AXIEM Award, the Omni Award and the Writer’s Guild of America Award.